NEW YORK (CNNMoney) -- Streaming music service Spotify wants to be more than a music app: It's aiming to be a platform for everything you would ever want to read, see, do or share around the music that fills your days. Spotify took the first step toward that vision Wednesday by launching Spotify Apps, a new system developers can use to build add-on features for Spotify's own software. "We're opening up our platform in a way that lets you curate the apps you want," Spotify CEO Daniel Ek said at a launch event in New York City. The new offering kicked off with a handful of launch applications from Spotify partners. A TuneWiki app lets users read lyrics while listening to songs, while a Rolling Stone app brings playlists and articles into Spotify. A Billboard app turns the publisher's "top 100" charts into playlists. One of the most intriguing apps shown off at the demo is Songkick, which searches users' music libraries and suggests local concerts and events that might appeal. "We have a lot more in the works, but more than anything we look forward to being surprised by our developers," Ek said. Spotify's platform move takes a page from the game book of Facebook, a close Spotify partner. The social network decided several years ago to open its service to outside developers, transforming Facebook into a foundational layer for an ecosystem of externally created games, tools, widgets and features. Twitter has moved in a similar direction. 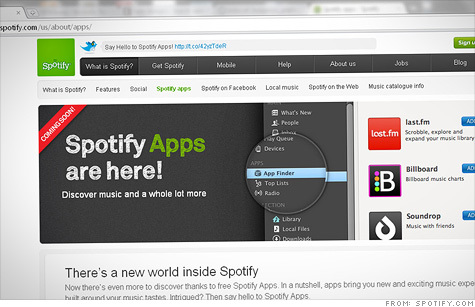 For now, Spotify apps are free for all Spotify subscribers. When asked if they'll stay that way, Ek skirted the issue. "We're creating this platform knowing it's the early days, and we'll figure things out along the way," he said. "Right now, there's really no monetization within this platform." Spotify, which launched in the U.S. in July after becoming a giant hit in its native Europe, offers a free, ad-supported streaming service and a paid premium version. Priced at $4.99 to $9.99 per month, Spotify's paid version adds offline music availability and other advanced features. At Wednesday's event, Ek rattled off the latest Spotify stats: The service now has 10 million active users and 2.5 million paying subscribers worldwide. Ek didn't offer a breakout on its U.S. subscriber base.